Frontpoint is widely considered to be one of the strongest players in the home security space, particularly with its heavy emphasis on outstanding customer service. In fact, Frontpoint is one of the most highly rated systems in our best home security system comparison. While SimpliSafe may not be as highly rated as Frontpoint, it’s still a proven company with unique things to bring to the table, including a more budget-friendly monitoring price tag that’s one of the industry’s least expensive. When comparing SimpliSafe vs Frontpoint, here’s how the two providers stack up in a head-to-head matchup. Frontpoint and SimpliSafe have both built a reputation for customer-friendly practices in an industry that’s often associated with locking customers into contracts. The two providers are similar in a number of ways, from their DIY installation options to their A+ Better Business Bureau ratings. Both Frontpoint and SimpliSafe also offer 100% cellular service with 24/7 monitoring, something we highly recommend in a security system. However, they do have a few key differences that set them apart. Aside from its commitment to transparent pricing, one of SimpliSafe’s standout features is something called Secret Alerts, a feature only available in the company’s higher-tier Interactive monitoring package. Secret Alerts are private notifications triggered by sensors you can install in sensitive places throughout your home, such as your safe, desk drawer, or liquor cabinet. Rather than triggering an alarm, it notifies you by text or email when someone—like a roommate, friend, or family member—is messing around in places they shouldn’t be. Frontpoint excels in customer service as well, but goes a step further than SimpliSafe in offering a fantastic feature known as Crash & Smash protection, associated with partner Alarm.com. The way it works is if an intruder breaks into your home and attempts to destroy your security system unit, the alarm will communicate to one of Frontpoint’s remote monitoring sites, even if the thief succeeds in smashing it. Then it’s only a matter of time before the authorities arrive to apprehend your unwanted guest. SimpliSafe has similar protection in place, but it’s not as complete. With SimpliSafe, if the burglar finds your SimpliSafe base station (which is separate from the keypad used to operate the alarm), they can disable the system without any signal reaching a monitoring station. This isn’t exceedingly likely to happen unless the thief has scoped out the place carefully beforehand, but it’s something to be aware of, and ultimately a notch in Frontpoint’s favor. Frontpoint and SimpliSafe let you try their products and monitoring service with a money-back guarantee. Frontpoint has a 30-day risk-free trial before you sign a contract, where you can return everything and even get covered for shipping. SimpliSafe offers a similar risk-free guarantee, but theirs is 60 days with a full refund and shipping covered. Because equipment warranties are at least two years in either case, the extra 30 days with SimpliSafe are more of a luxury than a significant benefit, but the guarantee is certainly something you can take into account as you compare the two offerings. What kind of contracts do they require? The first thing to be aware of is that SimpliSafe has no contracts. Period. If you opt for professional monitoring from SimpliSafe, you pay for it month-to-month and can cancel with no hassle or fees. SimpliSafe also allows you to buy its packages without monitoring of any kind, if you so choose, but we always recommend professional monitoring to get the most protection out of your home security setup. By comparison, Frontpoint does have a standard three-year contract, but also allows you to choose a one-year contract if you’re willing to forego the substantial discount associated with that longer term. Officially, Frontpoint’s cancellation policy enforces an early termination fee of 80 percent of the balance on your contract. We recommend you read our full review of Frontpoint packages and cost of equipment to get thorough insight into potential costs within a contract. When it comes to contracts, it’s hard to argue with SimpliSafe’s simple, worry-free lack of contract. Instead of being locked into paying up to $1,800 over three years with Frontpoint, you can pay considerably less with SimpliSafe and never be locked into anything beyond the current month’s fee. Within the broader home security industry, Frontpoint’s no-risk guarantee and customer-friendly contracts are a bright spot, but SimpliSafe’s “cancel anytime with no fees” arrangement definitely puts it ahead in the contracts category. How do they treat customers? 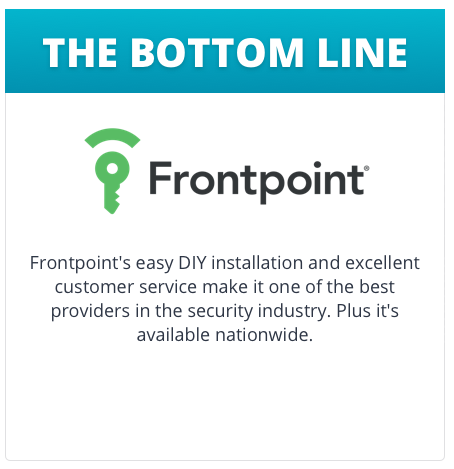 Frontpoint is the undisputed champion of customer satisfaction in home security. If you search for Frontpoint online, you’ll see how much its customers love Frontpoint’s customer service, ranging from its great support for DIY installation to its knowledgeable phone reps. Frontpoint’s customers also appreciate the price transparency, lack of hidden fees, and risk-free guarantee. Of course, SimpliSafe customers think highly of similar qualities in their provider, as well as the affordability and lack of contracts. SimpliSafe and Frontpoint share an A+ rating with the Better Business Bureau and both have overwhelmingly positive customer reviews, but compared to Frontpoint, SimpliSafe comes up short. Some customers have found it difficult to get a hold of a live representative through customer support, and some customers have complained about the alarms not working. 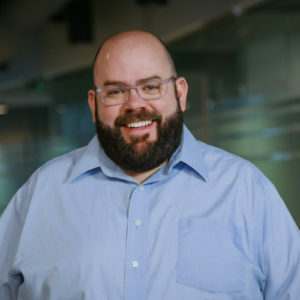 Frontpoint’s reputation is geared toward best-in-class customer service, a reputation they’ve earned and proven they deserve over many years, and most shoppers really value it. Because of its overwhelmingly positive online reviews, Frontpoint comes out on top in customer service. Both Frontpoint and SimpliSafe’s systems require DIY installation only. SimpliSafe lacks live chat, but does have email and phone support, as well as a help center on its website. On the other hand, Frontpoint’s support options include phone, email, live chat, and a resource center. The good news is Frontpoint or SimpliSafe’s systems can be conveniently installed without needing to wait for a professional to come do it for you. While both systems are easy to install, Frontpoint’s help resources are more comprehensive, including both video and reliable live support. Live support is a valuable resource because it resolves the main drawback to DIY installation, which is having to figure out the process on your own. If you have any questions or concerns while you’re handling the installation, having a live person to walk you through the process over your chosen medium will make everything go more smoothly and give you the best of both worlds between DIY and professional installation. Frontpoint comes out ahead because of the variety and quality of resources at its customers’ disposal. What equipment do they offer? With equipment primarily powered by GE, Frontpoint supports a wide range of different hardware makers. This is good if you like having more equipment to choose from, but the sheer amount of variety can ironically make the DIY installation more intimidating. 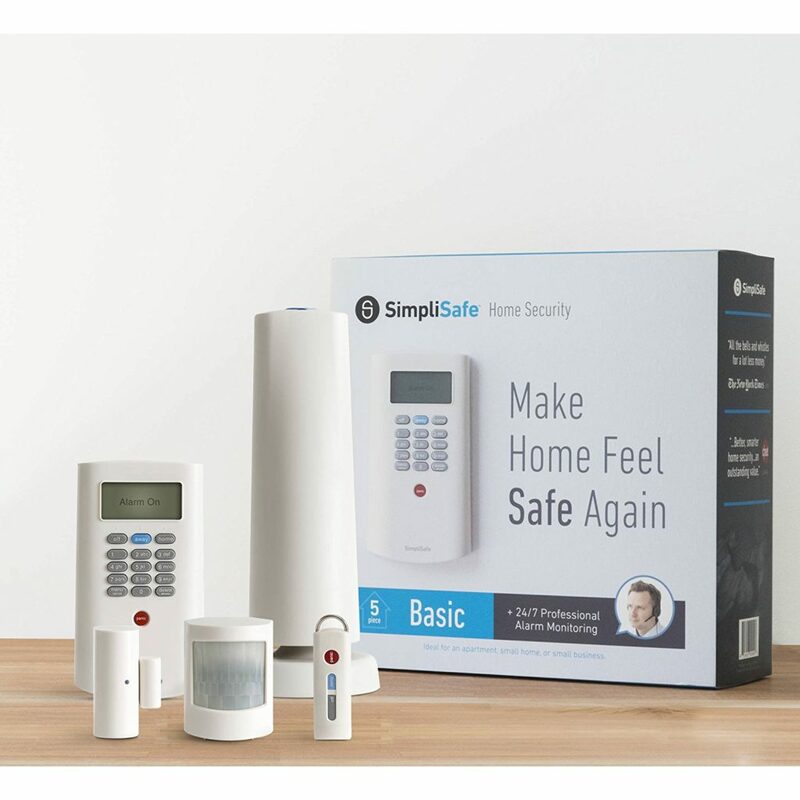 SimpliSafe has its own proprietary security system designed by a Harvard engineer. It designs all of its own sensors and other equipment offerings too. With SimpliSafe, you’re getting equipment manufactured by the company itself. SimpliSafe has a proprietary mobile app available for alerts and mobile control, and the company’s fully wireless hardware makes it a less intrusive and more affordable option for renters. However, some customers have complained about receiving the wrong hardware, while others have noticed that their SimpliSafe equipment can be hacked. SimpliSafe is committed to firmware updates to address these vulnerabilities, but it’s definitely something to be aware of. Lastly, you should know that SimpliSafe doesn’t offer discounts for its equipment, so you’ll pay upwards of $200 upfront to get started with the service. On the plus side, SimpliSafe offers a three-year warranty for its equipment, even for used systems. As the cheapest option, the Starter Package costs $229.96 and comes with one base station, one wireless keypad, one motion sensor, one entry sensor, and one keychain remote, while the Ultimate Package comes with all of these plus an extra motion sensor, three additional entry sensors, one panic button, one extra 105dB siren, one smoke detector, one water sensor, one CO detector, and one freeze sensor. The Ultimate Package’s price is a hefty $539.85. 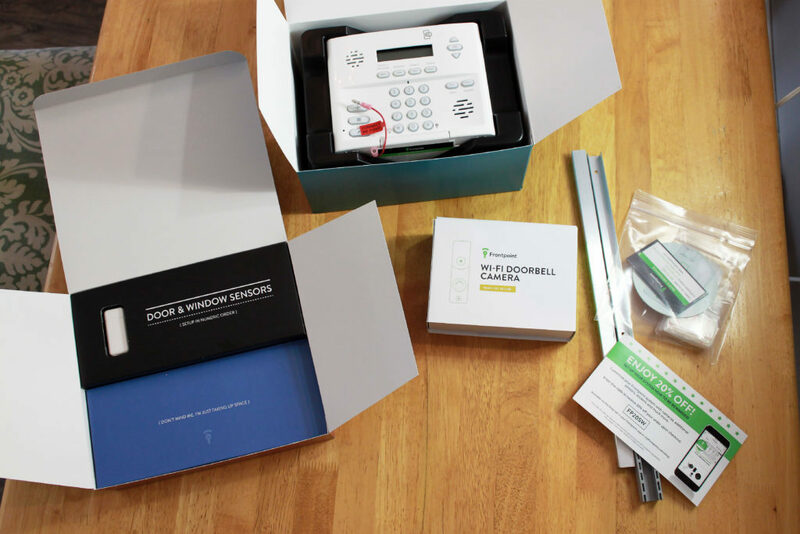 If you don’t like the available equipment packages, it’s also possible to build your own SimpliSafe system. This is similar to the customization option that Frontpoint offers, but without the upfront discount, cutting-edge features, and variety of equipment that make Frontpoint’s such an attractive deal. Frontpoint’s approach to equipment is different from SimpliSafe’s, with the sole emphasis being on customization. You start with the touch panel, but fill out the rest of the package based on your own needs. Unlike with SimpliSafe and other home security providers, Frontpoint doesn’t offer any standard equipment packages. Instead, they’ll ask you to identify whether you’re a homeowner, renter, or business, and then they’ll recommend which equipment you ought to include, like sensors, cameras, and home automation controls. This is a great feature that makes sure you’re getting only the equipment you need at the best possible price. The key with Frontpoint is to opt for the three-year contract, rather than the one-year to get the most value. Aside from the sheer variety of equipment choices you get with Frontpoint, and its commitment to get you the package that best meets your needs, the low upfront cost on equipment is a huge advantage. Frontpoint has an edge here, not just because of its quality equipment, but because of the company’s key partnership with Alarm.com. The technology behind Alarm.com provides a lot of additional functionality in its equipment and monitoring service, including wireless cameras, Crash & Smash protection, home automation equipment, remote monitoring, and other key features. Overall, SimpliSafe has good equipment, but it’s hard to recommend it over Frontpoint due to its lack of sophistication and potential security weaknesses. What do you get in each package? Who wins, Frontpoint or SimpliSafe? SimpliSafe has two huge advantages going for it: no contracts and an entry-level monitoring price of just $14.99 per month. That’s virtually unheard of in the home security space, and while the lowest-tier SimpliSafe plan doesn’t give you the same features as its Interactive plan or the higher-tier Frontpoint plans, it’s better than getting locked into $34.99 per month on the low end with Frontpoint. However, you are compromising on a number of features when you go with SimpliSafe over Frontpoint, especially with SimpliSafe’s Standard Plan. You’re missing out on several additional monitoring options, Crash & Smash protection, and advanced home automation, to name a few. If you want any of those higher-end features, you’re out of luck with SimpliSafe. On the other hand, if advanced features like home automation, and life safety monitoring aren’t a priority for you, SimpliSafe is a fantastic bang for your buck. Ultimately, it comes down to value for the money and what represents the right match for you. Ask yourself what you’re looking for in a home security provider. We can confidently recommend either service because of quality equipment, fantastic customer service, and forthright business practices. We do have a few concerns with SimpliSafe that keep it from being our first recommendation, including the alarm hacking vulnerability and some customer service frustrations. However, the lack of contracts, amazing monthly monitoring prices, and customer-friendly practices still make SimpliSafe a solid option for budget-conscious shoppers. On the other hand, Frontpoint continues to delight customers with low upfront equipment costs, a host of cutting-edge technological features, industry-leading customer service, and huge equipment selection. Fundamentally, we look for companies that offer reliability—in customer support, equipment, service, and technology. Frontpoint excels in these areas, and that’s why the company makes our top home security systems (as does SimpliSafe). How have you fared with SimpliSafe or Frontpoint? Let us know your thoughts in the comments. This article states that it was published on 2/21/18, but is referencing SimpliSafe’s old system. They released a majorly revamped line in January that addressed a lot of critiques. I actually found this article using Google’s search tools for only pages posted within the last month. I was hoping to find an article that compared the new system and was misled. Hi Brad! Yes, we made an edit to the page so it shows as it was just written. We are working on a full review of their new system. Hey Maria, can you let us know when that article is available? Thanks!! Hi Jess! What article are you referring to? Feel free to email me at maria@reviews.org. Thanks!